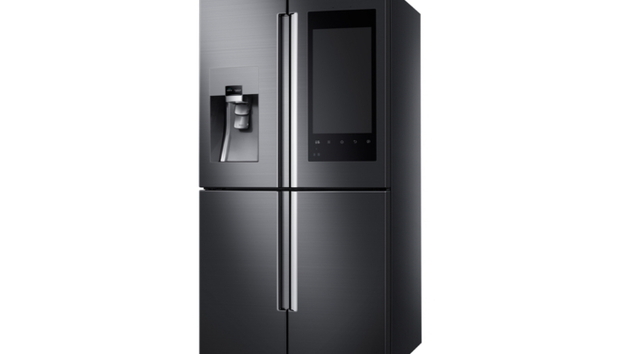 If you’ve ever wanted to send texts, browse Instagram, order groceries, or mirror your TV to a giant sceen on your refrigerator, you’re in luck: Samsung’s over-the top four-door Family Hub refrigerator is out this spring. This refrigerator is insane. Samsung put a 21.5-inch high-definition LCD touchscreen display on the outside of the refrigerator’s top right door. Using that screen, families can leave each other notes, share photos, check their calendars, mirror their Samsung smart TV, stream music, and partake in a host of other activities you probably never even thought you might want to do on your fridge (and, um, you might still not want to do). One fridge activity that makes a ton of sense is grocery shopping, which Samsung’s Family Hub makes possible with an app from MasterCard called, appropriately, Groceries by MasterCard. Betty DeVita, MasterCard’s chief commercial officer, called it the first shopping app integrated into a refrigerator. When it launches, the app will be integrated with grocery services FreshDirect and ShopRite. A partnership with MyWebGrocer, which services thousands of grocery stores around the world, is coming later. The app allows you to shop from your Samsung phone or tablet, or from the Family Hub fridge, and even pay for orders from multiple places in one transaction. If you’re away from the fridge when you want to buy groceries but can’t remember what you need, Samsung has helpfully built cameras inside the refrigerator that capture a still photo of the interior every time you close the refrigerator door. Those photos are stored in the Samsung Smart Home app so you can glance at them while you’re on the go. Samsung hasn’t said how much all this innovation costs, but you can expect it to run at least a few thousand dollars, given that high-end refrigerators without all this built-in tech cost more than $2500. I can’t decide if the Family Hub refrigerator the best appliance I’ve ever seen or completely whackadoodle, but stay tuned for a close look later this week. Samsung’s WiFi oven doesn’t have a touchscreen, but you can control it from an app. Samsung has a few other smart appliances on deck at CES this week, including a Wi-Fi-equipped oven that you can control remotely using a smartphone app. You can preheat the oven before you arrive home, or make sure you turned off the burners after you’ve left. This appliance, sadly, does not come with a built in touchscreen. One more appliance innovation we’re seeing from Samsung this week is more practical: The company’s brand new front-load washing machine has a feature called AddWash, which is a compartment that slides out so you can add clothes after the wash cycle begins. It’s not fancy, but it solves a huge pain point in an already annoying chore.